In WWII Libya, an alcoholic British captain is charged with escorting two nurse to safety across harsh terrain in a dilapidated ambulance. 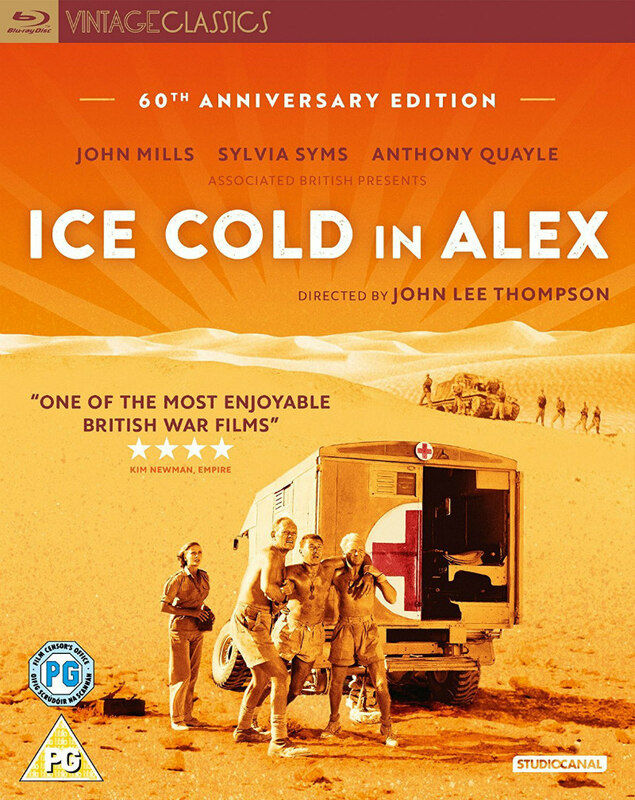 Perhaps best known to a generation of British TV viewers for its role in a memorable 1980s Carlsberg beer commercial, J. Lee Thompson's North African set WWII adventure Ice Cold in Alex celebrates its 60th anniversary in 2018. What better time to rediscover a somewhat neglected and under-rated war movie, and what better way to experience it than with this impressive 4K restoration from Studiocanal? That stalwart of the British war movie John Mills plays Captain Anson, an upper class officer stationed in Libya in command of an ambulance company, one who spends most of his time in an inebriated state, working his way through his prized crate of gin. As bombs rain down around his camp from the advancing Nazis, Anson is ordered to evacuate. Accompanied by working class Sergeant Major Tom Pugh (Harry Andrews, another great war movie staple), Anson finds himself tasked with escorting a pair of nurses - Sister Diana Murdoch (Sylvia Syms) and Sister Denise Norton (Diane Clare) - to safety in the far off city of Alexandria, Egypt, known to Anson as the home of a bar that serves the best beer in the Middle East. Along the way they pick up a stranded South African soldier (Anthony Quayle), who begins to draw suspicion from the Brits about his true intentions. Soon after the release of Ice Cold in Alex, director Thompson would be snatched away from Britain by Hollywood, helming such blockbusters as Cape Fear, The Guns of Navarone and two instalments of the Planet of the Apes series. Ice Cold in Alex represents his finest work as a director however, as he piles one nail-biting set-piece on top of another, rarely giving the viewer a chance to catch their breath over a very short 125 minutes. Thompson's film may be adapted from a novel by Christopher Landon, and purportedly based on true events, but it's difficult to think the director wasn't heavily inspired by Henri-Georges Clouzot's 1953 picture The Wages of Fear. Like Clouzot's film, Thompson's features a rag-tag band of troubled individuals struggling to get a lumbering jalopy across a treacherous wasteland. As a cinephile you're expected to profess a preference for the Frenchman's film, but I'm in the corner for Ice Cold in Alex. Not only does it boast set-pieces that outdo those of The Wages of Fear, it has a human warmth missing from Clouzot's cynical thriller. As the journey progresses, we grow to love the small band of brothers and sisters assembled here, and thanks to great writing from Landon and T.J. Morrison, and gripping performances from all involved, everyone in Thompson's movie feels like a real person, even if they are occupying war movie archetypes. Mills is especially fantastic here. At the movie's opening we have little but contempt for him, as his drunken toff seems to be a lamb leading Andrews' and Syms' lions into danger with his disregard for his own liver. Watching his commanding officer's jeep explode under a shell, Anson's face contorts into an expression of terror, and thanks to Mills' skills as a subtle screen actor, we're never sure if he's mourning the loss of the man who just died or that of the crate of gin left aboard the vehicle. The more time we spend with him however, the more we come to respect him - he's a highly competent leader; and forced to endure the hardships and responsibility he suffers, wouldn't we all appreciate a swig of gin now and then to dull our senses? I don't recall George Lucas ever acknowledging Ice Cold in Alex as an influence on Star Wars, but I was struck by the similarities on this viewing. The evacuation that opens the film prefigures that of The Empire Strikes Back; there's a taut sequence involving a character getting slowly crushed under the ambulance that plays a lot like the trash compactor sequence of A New Hope; a beautiful young woman who proves she can muck in with the boys; Tattooine-esque desert terrain; a treacherous Lando figure; and a bunch of characters regularly framed huddled in the ambulance cab like the heroes of Star Wars crammed into the cockpit of the Millenium Falcon. The most explicit reference can be heard in John Williams' track 'Rebel Motif', almost a note for note replica of Leighton Lucas's main theme here. Ice Cold in Alex may have been forgotten by mainstream audiences, but it appears to have inspired the filmmakers who have seen it. Thompson's film deserves a place in the war movie canon as much as Captain Anson and his thirsty crew deserve those glowing glasses of amber nectar they down in the film's iconic closing scene, as emotional a note as you could end a film on. This blu-ray was indeed "worth waiting for." British cinema expert Steve Chibnall discusses the career of J. Lee Thompson; Professor Melanie Williams analyses the film; Sylvia Syms interview; home video footage of John Mills; original trailer; stills gallery; and an excerpt from documentary A Very British War Movie Documentary. 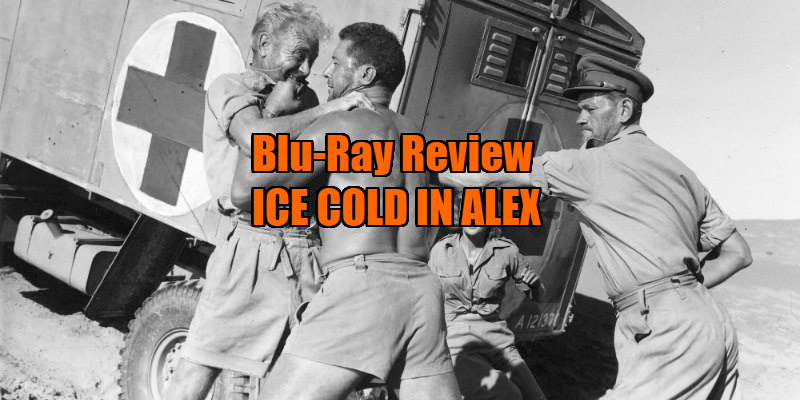 Ice Cold in Alex is on blu-ray February 19th from Studiocanal.